Unfortunately, brand experiences online often underwhelm customers. 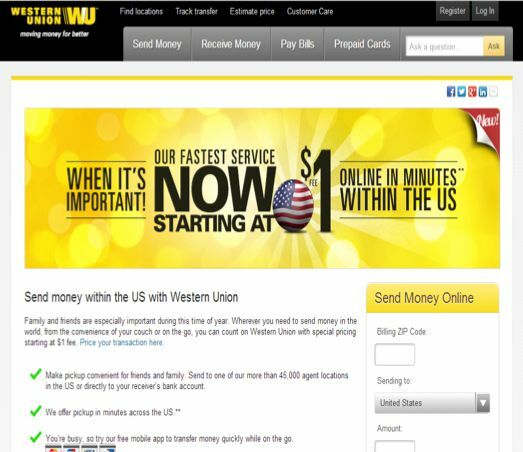 Western Union had a problem. 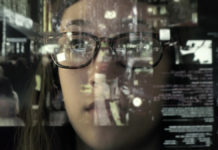 Its ecommerce platform-driven digital experience was inflexible, static and “one size fits all.” Serving over 200 countries in 70 languages, personalization, offer management and robust A/B testing is critical, but proved difficult. It’s mobile products were poorly rated and underused. 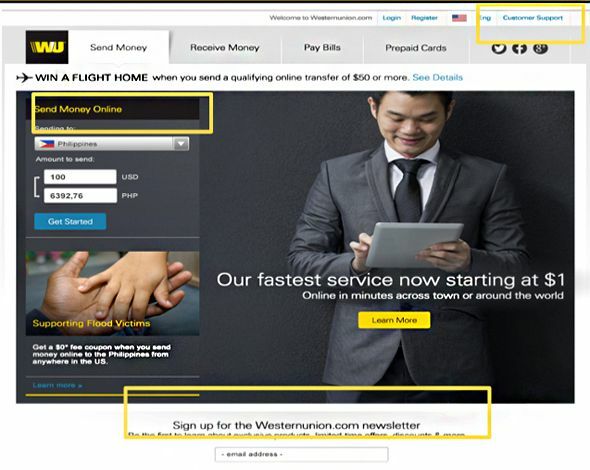 To expand its core retail money transfer business and grow new distribution through its dot-com site and respond to the rapidly changing complexity of customer behavior and preferences across channels, Western Union needed a digital transformation. 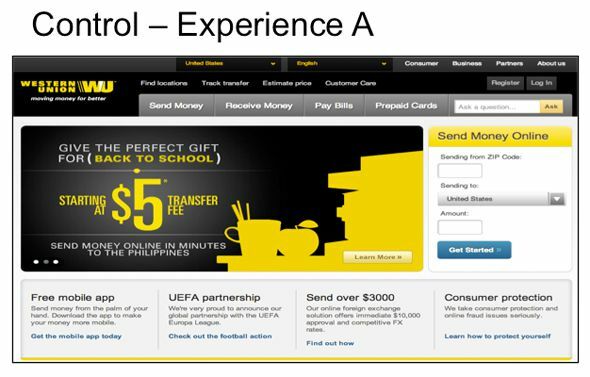 Western Union has a strong retail background, with over 500,000 agent locations and 100,000 ATMs in more than 200 countries and territories, and 1 Billion customers served. 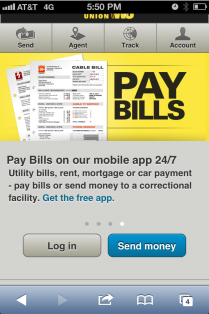 Online, it processes 29 transactions per second, over 242 million C2C and 459 million business payments completed. 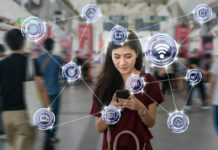 Its core business is account-based money transfer, with additional products for bill payment, foreign exchange, insurance, stored value cards and mobile wallet. The new solution is a CMS integration, with Adobe Experience Manager at the front-end. 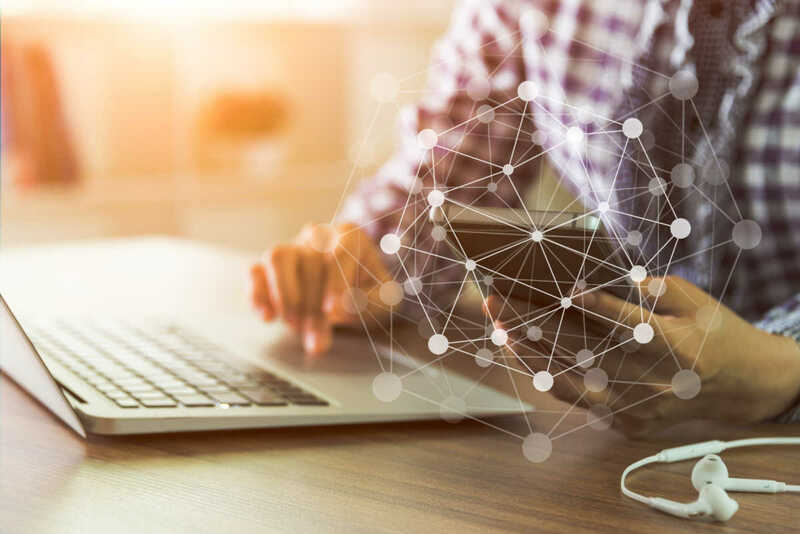 Experience Manager drives content assets, localization, targeting and personalization, while its ecommerce platform supports dynamic merchandising, advanced and international pricing. 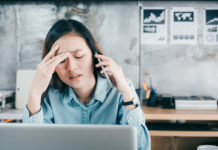 Now each component on a transactional page is broken down into components that are configured in the Adobe Suite, coming from the ecommerce platform. 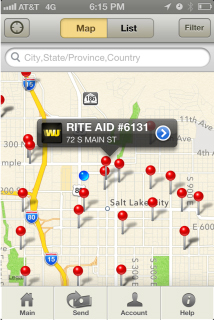 This offers flexibility beyond just the Western Union site. 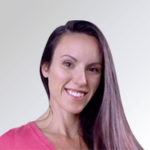 For example, a fee calculator widget can be embedded in affiliate and partner sites and any new mobile products, impossible when hard-coded into a single page. Marketers can now can do custom landing pages specific to customers in their context (country, returning customer, etc.) Instead of it taking 10 days before an offer can come together, dynamic quotes can be generated instantly. The widget-component approach makes it easier to create A/B test variations, including elements that have commerce embedded in their experience. 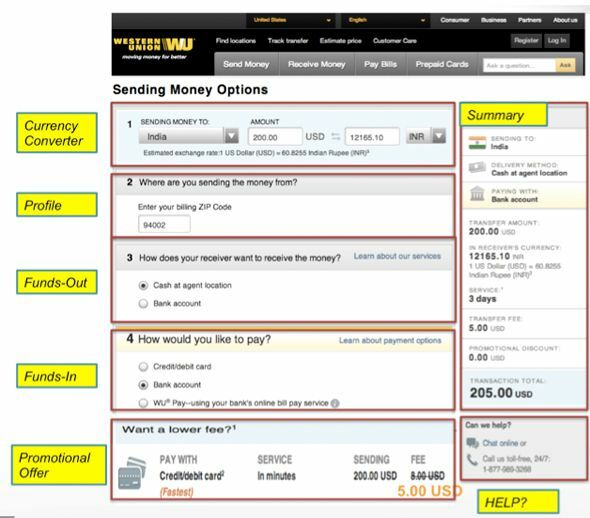 Critical to Western Union’s customer experience, the ability to serve the right currency and offers based on country, or pre-populate forms for returning visitors based on their previous interactions improve the customer experience tremendously. 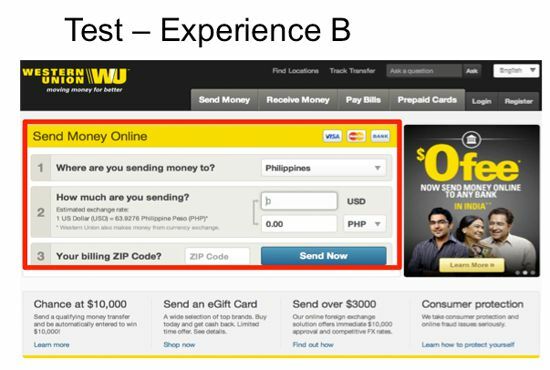 Analyzing heaps and heaps of data (based on 1 Billion customers’ interactions), Western Union has a good idea of who their customers are — though original assumptions were proven wrong! For example, there’s a misconception that immigrants traveling to and living in new cultures stick to the norms of their old culture. Americans moving to the Netherlands, for example, will embrace online bank transfer and move away from credit cards. This is important to understand when targeting offers in context throughout their life cycles. 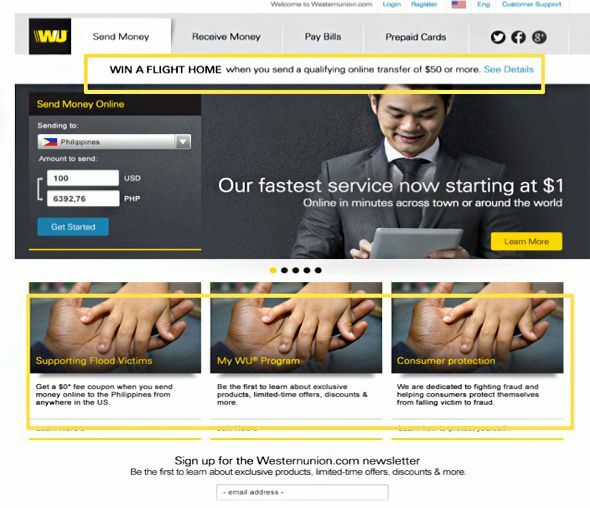 The Philippines is a key market for Western Union. The site was able to present a tailored offer for US-Philippines transfers in support of flood victims. 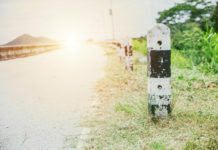 With so many permutations of country-to-country transfers and the rules that have to fire for regulatory compliance, payments in and out, payment methods and so on, without a truly integrated system, things get complicated. The combination of localization and complex global pricing is key. 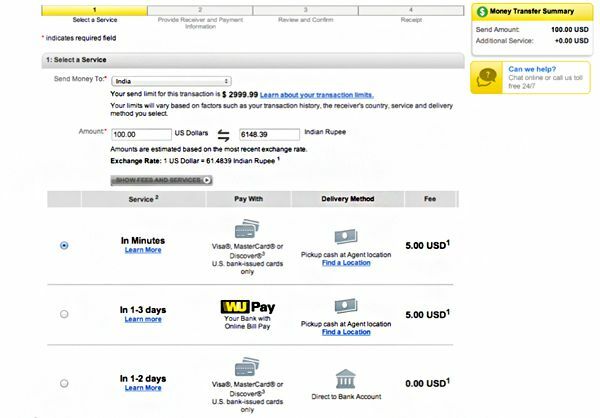 Injecting these technologies into its ecommerce solution enables Western Union to launch mobile apps with full functionality. 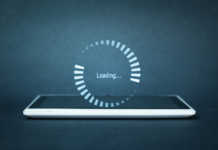 The mobile app was very limited — one would start a transaction and at the end would be required to snail-mail more information. The result was poor experience and poor App Store ratings. In less than 7 months, the app has close to a 5 star rated app. 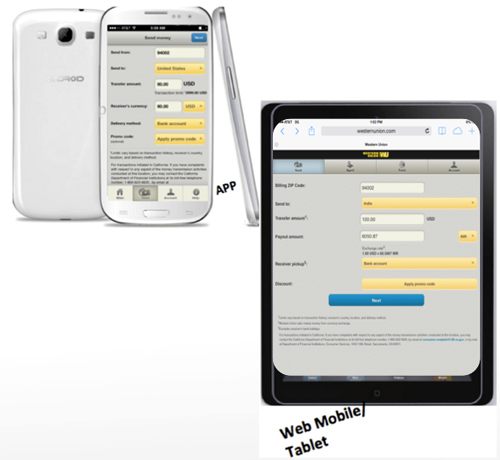 The mobile optimized (m.dot) experience is also critical, as many customers still use feature phones, especially in the third world. In fact, Kenya and Uganda are way ahead of the West in mobile money transfer. To see the entire session replay, view on demand at Adobe Summit Online.